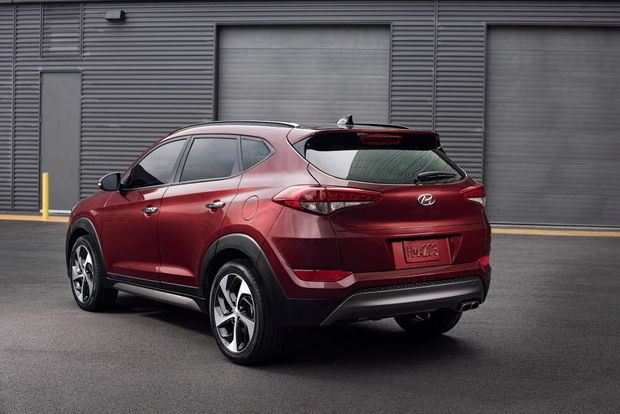 Hyundai has redesigned its compact Tucson crossover utility vehicle for 2016, giving it a sleek new look based on the company’s “Fluidic Sculpture” design theme. The re-do has made the Tucson a bit larger than the previous model, but also lighter, in an attempt to boost fuel economy. Prices for the new model begin at $22,700 (plus $895 freight) for the base SE six-speed automatic with the 2.0-liter four-cylinder engine and front-wheel drive; and $24,100 for the same vehicle with the optional all-wheel drive. In the middle are the Eco and Sport models. The Eco with the 1.6-liter turbocharged four-cylinder engine and seven-speed EcoShift dual-clutch automatic gearbox starts at $24,150 with front drive, or $25,550 with all-wheel drive. The Sport model, with the same drivetrain configuration, begins at $26,150 with front drive, or $27,550 with all-wheel drive. At the top of the line are the two Limited models, both with the 1.6-liter engine and seven-speed gearbox. With front drive, the Limited starts at $29,900, and with all-wheel drive, $31,300. The manual transmission from the previous generation is no longer available, but the EcoShift transmission offers nearly the same experience without having to fool with a clutch. It’s essentially a manual gearbox shifted automatically by servos, and on our Limited front-drive tester, it felt as though someone else was shifting gears in a manual transmission for us as we drove down the road. It’s sometimes a bit jerky, which takes a little bit of getting used to. This minor annoyance isn’t limited to this Hyundai transmission, though. It’s a hallmark of virtually all of these new automatic-manual transmissions, which originally appeared in Porsche vehicles, and now are found in Volkswagens and Audis and are beginning to appear in other brands. The advantage is that this gearbox eliminates the need for a torque converter, which wastes power and fuel. The EcoShift gearbox helps give the Tucson slightly better fuel economy, especially when paired with the 1.6-liter turbo engine. EPA fuel economy estimates for our front-drive Limited tester with this engine and transmission are 25 mpg city/30 highway/27 combined. During our weeklong test, with about a 30-70 mix of city-highway driving, we averaged a respectable 27.9 mpg, even with my somewhat heavy right foot. This is quite decent mileage for a roomy and comfortable crossover that can handily carry five people and their luggage. There are bucket seats up front and a three-person bench in the rear. On our Limited tester, power was impressive, which is a testimony to what automotive engineers are achieving these days with small turbocharged four-cylinder engines. There was never a lack of power even when I needed bursts of acceleration to pass or merge with traffic from uphill freeway on-ramps. But I did need to use the cruise control to keep from inadvertently speeding once I got onto free-flowing highways. The Tucson is based on the chassis of the Elantra sedan, and shares its architecture with the similar Kia Sportage. It competes in the popular compact crossover segment that includes the Honda CR-V and Toyota RAV4, as well as the Ford Escape, Mitsubishi Outlander Sport, Nissan Rogue, Jeep Cherokee and Volkswagen Tiguan. With this newest Tucson, Hyundai continues its practice of offering more value than most of its competitors. It has an “edgy” new exterior design, Hyundai boasts, and that’s true. 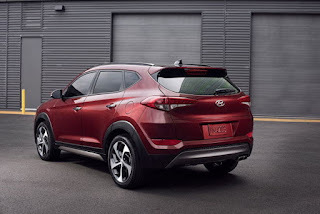 It’s the next generation of Hyundai’s Fluidic Sculpture design theme, whose first version was included on the previous generation of the Tucson, which arrived for 2010. It’s not at all boxy or station-wagon-looking. But it’s not entirely original, either — it looks a lot like the RAV4, CR-V and Escape. I wonder sometimes if the designers for vehicles such as these all work together in the same room. 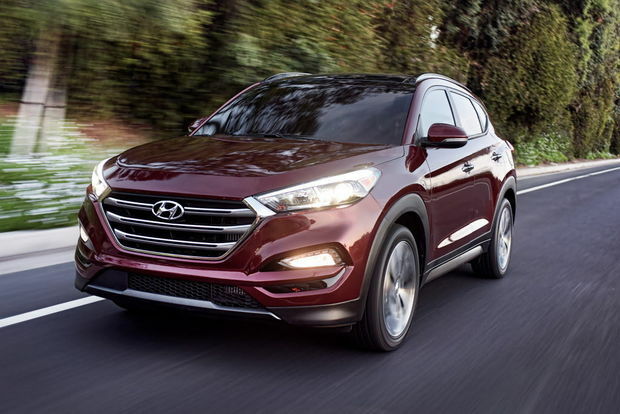 The large hexagonal grille is impressive, though, and helps make the Tucson stand out from the crowd. It’s similar to the grille on the newest Infiniti vehicles. As with most of the newer vehicles on the market, the redesigned Tucson is offered with a host of advanced, high-tech safety features previously found only on luxury vehicles. These include Lane Departure Warning, Blind Spot Detection, Rear Cross-Traffic Alert, Lane Change Assist, Backup Warning Sensors and Automatic Emergency Braking. All of these came at no extra charge on my Limited model. We also had the Hands Free Smart Liftgate, which Hyundai has been promoting heavily in TV ads. It opens automatically when you get within a few feet of it with the key fob in your possession. My grandson loved the full-length panoramic sunroof, allowing both front and rear passengers day or night skyward visibility. We enjoyed it while stargazing on a nighttime drive in the country, and also when watching some spectacular fireworks. Although our tester didn’t have the optional all-wheel drive, that’s something I would add if I were buying this vehicle. The Tucson also has the next-generation of the Hyundai Blue Link system, with enhanced safety, service and infotainment telematics. Navigation and audio were combined, with a satellite radio premium audio system with eight speakers. The Tucson is offered in eight exterior and three interior colors. Six of the exterior colors are new: Chromium Silver, Coliseum Gray (included on our tester), Ruby Wine, Mojave Sand, Sedona Sunset and Caribbean Blue. Carried over are Winter White and Ash Black. Interior choices are black, beige and gray with cloth seats, and black or beige with leather. Our Limited had the black leather.